Today's challenge was to sale yourself in 10 words. 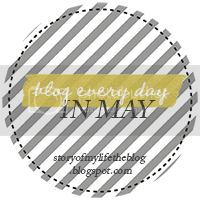 I almost didn't make posting this in time for it to count for the blogging everyday in May. I woke up at 5. which I think should not be allowed on a Saturday. I took Abbey to the middle school for her trip (we live 30+ miles from the school) then came home got ready for a training I was assisting with, After that went to out to eat (which involves the same 30+ mile trip) shopped and then came home and crashed for a few hours. I may have to make that 30+ mile trip again to get Abbey from the trip. waking up early on the weekend should be illegal! That's a long journey to get places. Yikes.